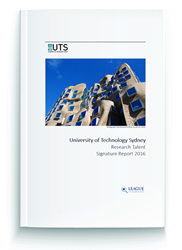 The League of Scholars Research Talent Signature Report enables you to get a new perspective on the research talent at your University or research organisation. This detailed and customised report contains a snapshot of up-to-date data on researchers at your institution compared with nearly a million others at the Top 2000 institutions worldwide. This shows where your institution has large research teams. University of Manchester, for example has the largest group of Graphene researchers in the world; Harvard University has the largest group of Computational Biology researchers while University of Cambridge has the largest group in Structural Biology. This shows where your institution commands relative comparative advantage. Our data, for example shows for University of Toronto Functional Genomics is among their Top 10 Research strengths - an area they lead the world in; Desalination is an area University of Technology Sydney leads the world in and Paleoclimate is an area of advantage for Columbia University. Each signature report contains numerous ranked lists of individual researchers to help identify top scholars of today and tomorrow within your organisation. Researchers who are currently established domain leaders in their field, ranked by topic and total career citations in last five years. Researchers who rank among the World leaders in their field - ranked by League of Scholars Whole-of-Web Ranking (WoW) that takes into consideration a range of factors including the impact of publishing venues, industrial liaison and public engagement via media. World leaders in their field - ranked by League of Scholars Whole-of-Web Ranking (WoW) across multiple fields. Youngest Top-Ranked Whole-of-Web ranked authors.